There are some simple steps you can take at home to keep you Birkenstocks looking great. Step one, keep your sandals away from extreme heat – that means don’t dry them next to the campfire or fireplace. If they do get wet, take your time. It’s best to let them dry slowly away from direct heat. You’ll also want to keep an eye on the cork footbed and nubuck/leather straps. You can do some light sealing/cleaning yourself, or you can bring them in to us. We will clean your straps, the cork, and renew the cork for $10 a pair. 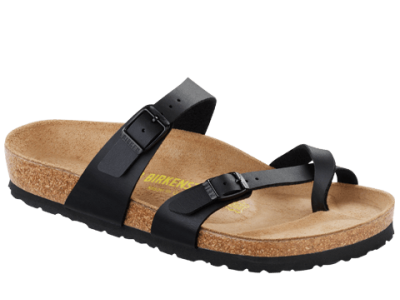 The beauty of Birkenstocks is that with basic repairs you can replace the leather top covers, the footbeds, the buckles, and/or the straps. We can even splice in new heals. We’re also able to do some in-depth modifications to get a great fit. Our specialists can add a soft footbed, take out the toe bar, adjust the arch height up and down, or even cast a custom footbed. We carry the Birkenstock line because they’re as committed to great footwear as we are. We’re also happy to repair your much loved Birks, they’ve carried you many miles and have great stories to tell. Check out the latest styles while you’re in, but don’t ask us to end that old debate: Should you wear socks with your sandals?